One of the best features that you will enjoy as a Mini Price Storage customer is the use of our move-in truck with no daily rental charge. 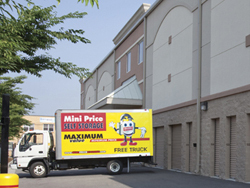 Our free truck not only saves you money, but it also makes your move into storage easier. Move your items without having to make multiple trips. See this humorous video that shows you how NOT to move your belongings into self storage. Don’t try this at home!